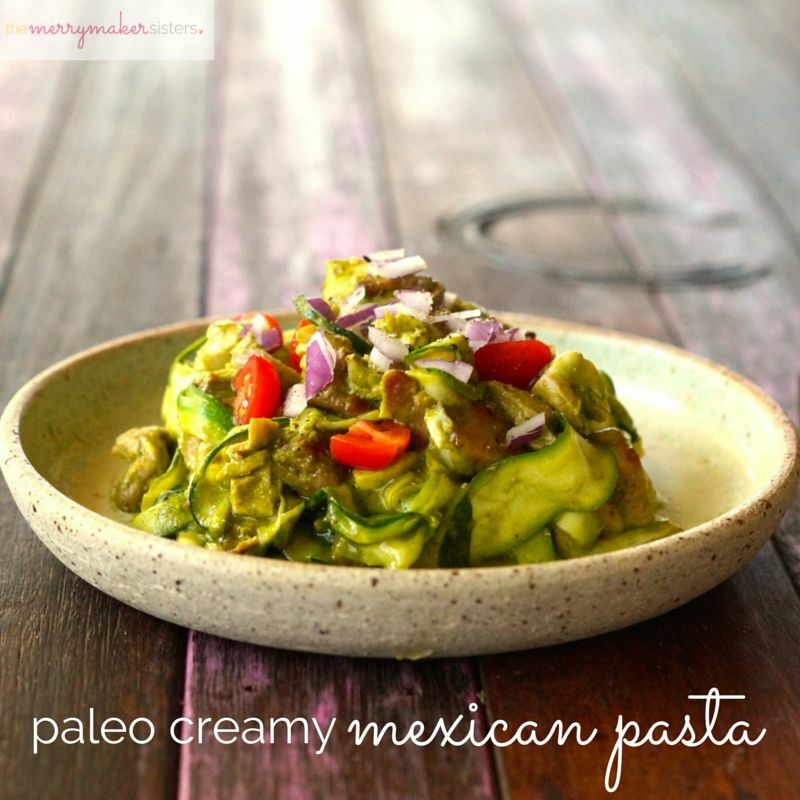 Paleo Creamy Mexican Pasta! This recipe is all kinds of quick, easy and delish! A crazy story (ok, it’s not that crazy) is that this recipe wasn’t even supposed to exist! We had planned to make our creamy pesto pasta and then realised… we didn’t have a lemon but we had a lime, we didn’t have fresh basil but we had fresh coriander, we didn’t have mushrooms but we had chunky bacon! So we swapped these ingredients up as a little experiment, added some spices and voilà! This is what you get! 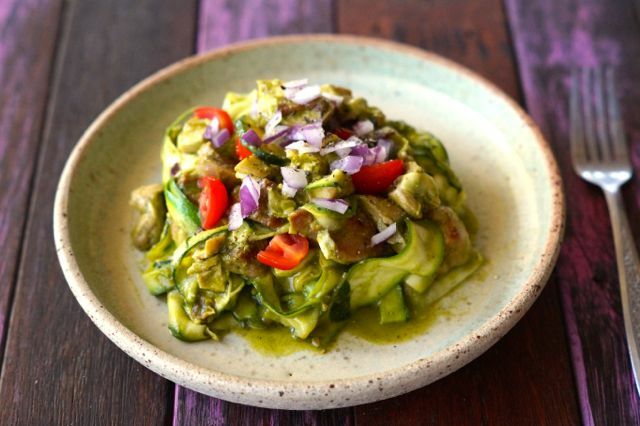 Our Paleo Creamy Mexican Pasta! And it blew our taste buds so we HAD to share it! 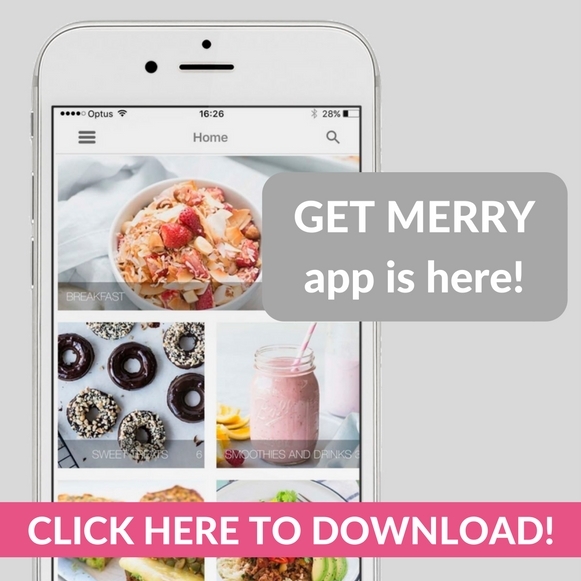 We think it might feature often on the merrymaker weekly meal plan! You can whip it up in around 30 minutes, be sure to make extra so you can take left overs for lunch! In a pan on high heat, place the bacon and shallots. Cook until the bacon gets crispy! Meanwhile, in a food processor whiz the avocado, coriander, lime juice, olive oil, garlic, paprika, chilli, cumin salt and pepper until really smooth and creamy. Add the chicken to the pan and cook for around 8 minutes, turning the chicken pieces to make sure they cook evenly. Now add the creamy Mexican sauce to the pan and stir well. Lastly, add the zuchinnis and tomatoes to the pan and stir through. Serve with fresh cracked pepper and freshly chopped red onion!